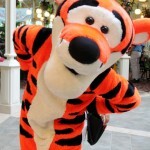 Tips from the DFB Guide: Should I Book a Disney Character Meal? 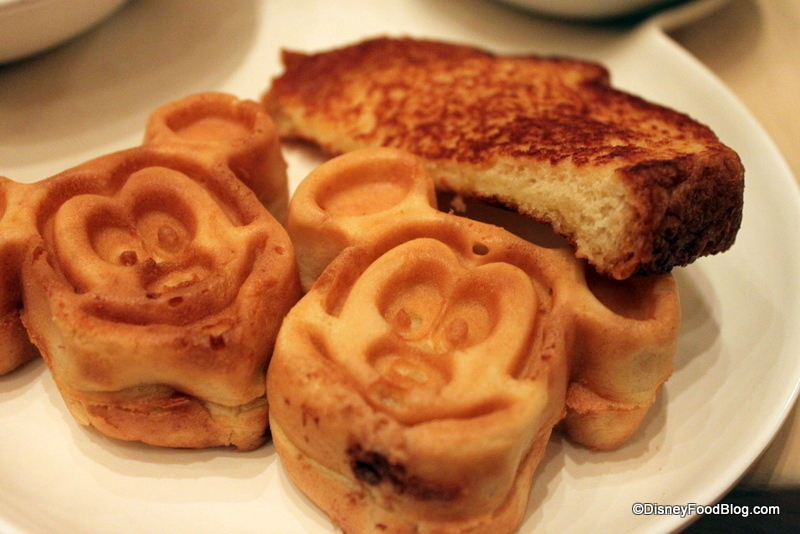 Dining at Walt Disney World is very often an experience rather than just a meal. It’s become a rite of passage to dine with characters during a visit to Disney — and there’s stiff competition to secure Advance Dining Reservations at some of these table-service restaurants. Meeting Cinderella, rubbing Pooh’s tummy, hugging Mickey Mouse, and posing with Chip and Dale are some of the memorable moments that can be discovered while dining at Character Meals. But is a character meal right for your group? On one hand, adults and kids alike enjoy meeting characters from Winnie the Pooh’s Hundred Acre Wood, Cinderella’s Castle, and more! Yet on the other, character meals can be costly — both in time and money! We’ve been to countless meals in which Disney characters hobnob with guests, and now we can help you determine if a character meal fits well into your next Disney vacation! 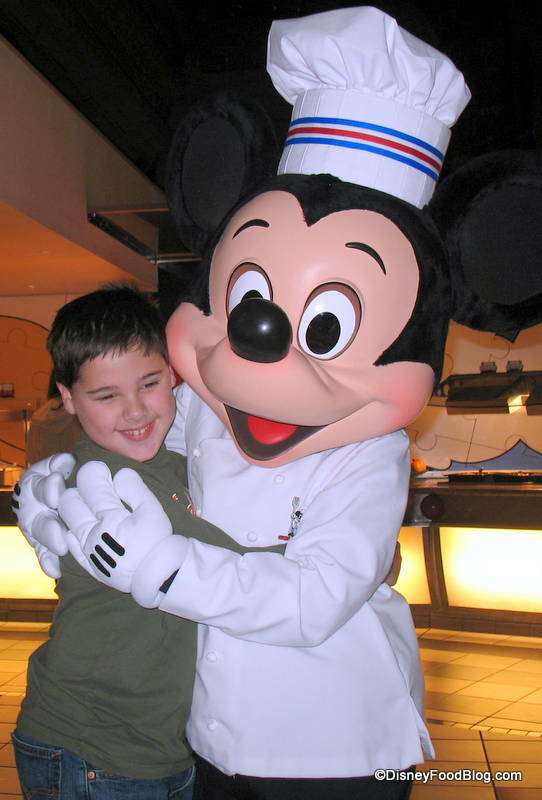 Chef Mickey serves up fun and food at the Contemporary Resort! 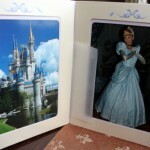 In our The DFB Guide to Walt Disney World® Dining 2013 e-Book, we have an informative section on character meals. Pick up your copy here for an extra $4 off using code 2013 for a limited time! Your vacation is an investment and we want you to have the best trip possible! Should I book a character meal? Let’s get right to some important dining considerations that we’ve included in the DFB Guide to help you plan your meals. 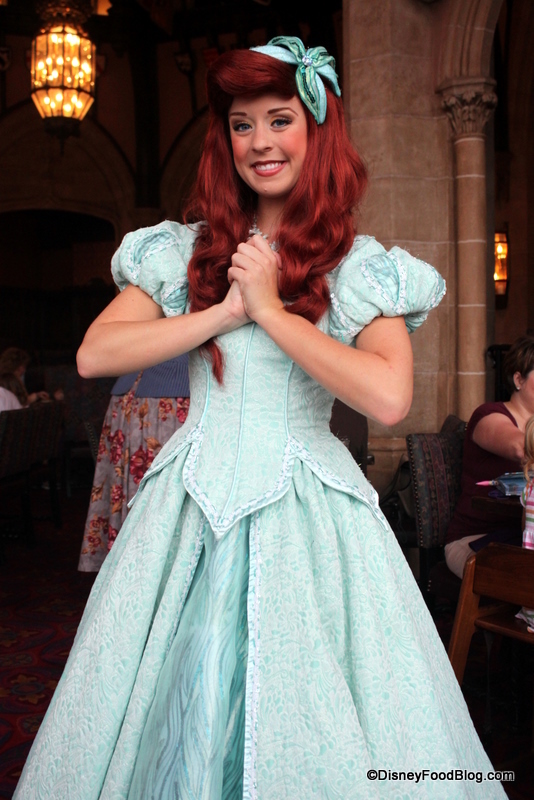 Meet the princesses at a character meal! 1. Do you have kids who may be afraid of characters? 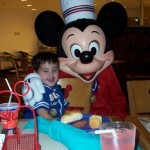 Character meals can be a good place for children to get to know the Disney characters. However if one (or more) of your children are not fond of the characters then consider dining at a restaurant with a fun theme instead. Not sure if your kiddo hates characters? Here’s how to find out without too much trauma: Book a character meal for later in your trip, then let your child watch some characters in the park from a safe distance. If he’s intrigued, the character meal is a great place to get closer. If he’s terrified, cancel your meal. Ariel is a "face" character! Human characters are less intimidating to small kids. DFB Guide Tip: Shy kids or those terrified of life-size mice can be seated away from the aisle. Parents should let the visiting character know that a friendly wave is more desirable than a furry hug. 2. Are you on a strict budget? Guests on very tight budgets may want to wait until their next trip to invest in a character meal. After all, you can see the characters in the parks — albeit often with hefty lines. And there’s no doubt that you can likely spend less on a meal if you bring your food with you or dine at a counter-service restaurant. Have a meal with character! 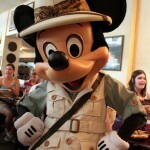 DFB Guide Tip: Dining with characters is less expensive at breakfast. We like the breakfast buffet at Cape May Cafe for its low price and delicious menu. 3. What’s more important — the atmosphere or the food? If you’re traveling with a group of foodies, a character meal (including those fancy digs in the Castle) may not offer the best eats available on property…even though they may be some of the most expensive. Many character meals are buffets, and while Disney offers decent eats at these, it probably won’t be gourmet-quality. Be sure to consider this before spending your dough (or a precious table-service credit or two) on a character meal. DFB Guide Tip: We especially like the menu at Tusker House in the Animal Kingdom. It’s a good spot to find more unique eats. 4. Is your group adults-only? This is kind of a trick question for us. We always go to character meals even if we don’t have kids with us. And I think that’s what many folks would recommend. Disney characters are fun for all ages, and you’ll find that many Disney characters enjoy interacting with adults as much as they do with children. 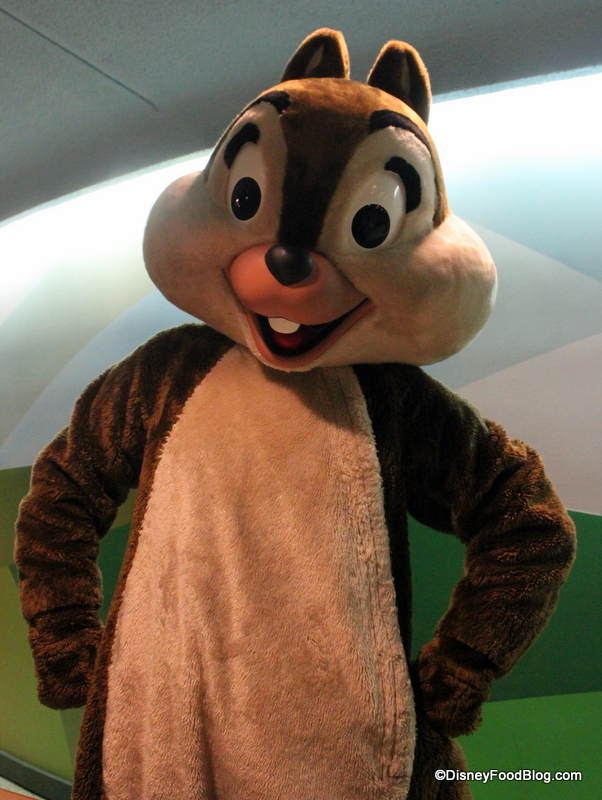 You can tell Chip and Dale apart because Chip has a "chocolate chip" nose! DFB Guide Tip: If you’re dining with a group of adults at a character meal, think of some fun or funny questions you can ask the characters when they come to your table. It’s always interesting to hear what they have to say if you ask them about some of their “family members” from their film! Get More Insider Tips About Disney Character Meals! We love helping you with Disney Dining plans and we answer numerous questions about character meals in The DFB Guide to Walt Disney World® Dining 2013! We’ll help you decide not only if a character meal is right for you — but what restaurant is the perfect fit for your family! Click here to get your copy of The DFB Guide to Walt Disney World® Dining 2013 E-book — and use code 2013 for an extra $4 discount for a limited time! 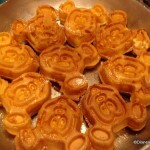 Do you always include a character meal in your Disney vacation? Share your thoughts on character meals in the comments below! I definitely agree that character meals aren’t just for families with youngsters. 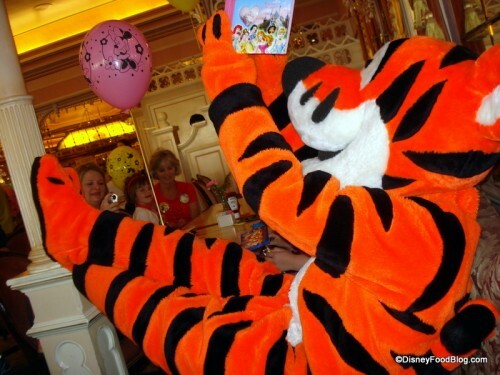 My daughter is now 21 and we still get a huge kick out of doing these things, and it really seems that the characters themselves get a kick out of adults joining in with the fun so don’t feel that they won’t interact with you if initiate something. In fact some of the best character interactions we have ever had have been at character meals, Donald is always good value, even more so if you get on his good side by wearing his merchandise or his ‘stroppy’ side by wearing another of the Fab 5’s! We prefer meals with fur characters as opposed to face, they just seem to enjoy ‘letting go’ more. Often too we’ve found that kids who are a little reluctant to have the characters approach them are willing to do so if Mom or dad or Grandma gets in on the action too, maybe scratching Pluto’s head, bouncing with Tigger, or pulling faces with the Mad Hatter. We love the character meals too. The first one I remember was with the fab 5 on board the Empress Lily (now Fultons Restaurant). Goofy got in serious trouble because he messed up my grandmothers hair :). But I would say you can be a “foodie” and still enjoy the character meals. Our favourite is 1900 Park Fare for breakfast. The carved ham, smoked salmon, and the lobster eggs Benedict are wonderful. In fact it’s a tradition to go there the first morning of our trip and my brothers kids are now 16 and 13 so they are not really into characters but they are definitely in for the food!! I would definitely recommend to an adults only trip. Even moreso if it’s your 1st trip to WDW together. Try to schedule for your first day as I’m not sure we would have done it had it been on day 6 or 7. While the food was pretty basic, it did its job in keeping us sustained through our 1st day in the parks. 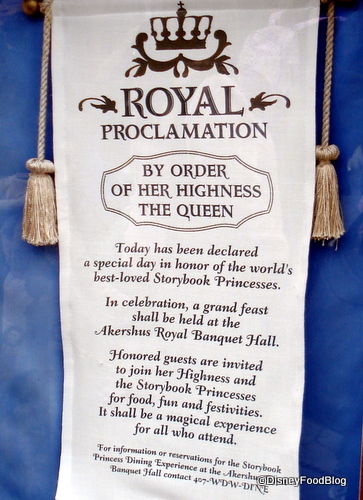 I think on our return trips we may go with a different Character Meal; perhaps 1900 Park Faire, Crystal Palace, or Akershus. Our last trip in January we ate at Garden Grove in the Swan. It is a buffet but they change the menu daily (we were there for southern BBQ night) and was shockingly one of, if not the best, meal we had the whole trip. Goofy and Pluto were there to hang out and since it never got too crowded while we were there our 5 year old daughter got to dance and play with them each a few times. On the flip side, since it was not super crowded or loud, and the dining room fairly large, there is no pressure if the kids are apprehensive. Little concerned by at your suggestion to book a character meal and then later cancel it. Out of the thousands who visit the park; if a hundred do that. it locks the rest of us out of the meal. A better solution is to take you kid to the mall to see Santa Claus or the Easter Bunny (or a local amusement park). If they don’t react well, then don’t reserve a meal in the first place. correction – Tusker House is in the Animal Kingdom Park not the Animal Kingdom Lodge. Just wanted to make sure this was pointed out so someone doesn’t become confused. 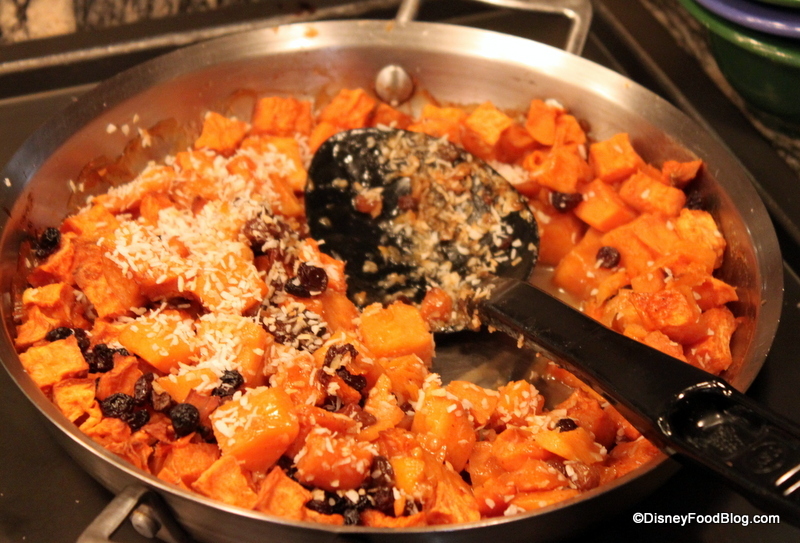 I think there are many good tips in this article concerning character meals. I am not concerned about booking a character meal and cancelling it later. Yay! For the family that gets a walk up because they did not realize they had to make reservations! I disagree with you Ed. My 19 month old daughter is terrified of Santa but loved the characters at Disney, especially at the character meals. We go to character meals and we never have kids with us! 🙂 We love the food and the fun; it’s pure Disney! As for the characters, some kids may not like them, while others in that same family will love them. Sometimes it’s the age that’s the factor. We love Crystal Palace, Chef Mickey’s and we just tried 1900 Park Fare for dinner with the Cinderella characters; everyone had a great time and would definitely go back again. It has been a few years since I’ve done a character meal, but I have fond memories of accidentally booking one about 10 years ago. Mom and I wanted a nice, relaxed buffet for the day we got in, and we booked 1900 Park Fare. Glad I’m older and wiser now. I love character meals. My favorite is Tusker House. @JoAnn: My kids and I love TH also. We try to book an early lunch 11-11:15 and we get to eat when they’re transitioning from breakfast to lunch. We pay lunch prices, granted, but we get access to the Mickey waffles and there is usually great character interaction because there’s fewer people in the resto. Last time we were there, Goofy and Mickey came by our table about six times each! Also, I love love love the chicken curry and naan bread together. 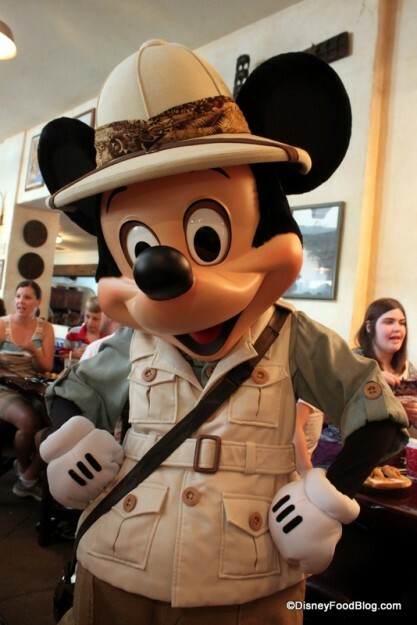 My favourite disney restaurants is Tusker house, Chef Mickeys, Kona Cafe and the Garden Grill restaurant. My favourite food was the Mickey Waffles, Chef Mickeys breakfast pizza, Plutos cheese blintz, Mickey Mouse oreo cakes, Cheese cakes and macaroni and cheese and brownies. And I loved the characters my favourite characters are Mickey, Pluto, donald and Goofy. I had a picture with the characters and the food was delicious and very nice.